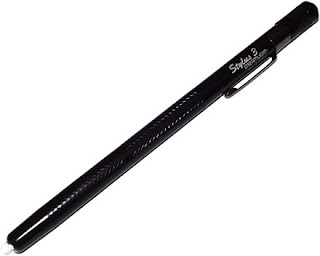 The Stylus is a pen-shaped flashlight by Streamlight. Among the many penlights in the market the stylus has the distictive advantage of being one of the thinnest versions being as thin as a regular ball pen or a mechanical pencil, other products are bulky when compared to a pen. The stylus has a button on the tailcap for momentary activation, you can also tighten the end cap for constant on mode when needed in a penlight momentary use is probably the most used mode so the button is very useful. The light uses three AAAA (that is four As) batteries, not very common to find but not hard or impossible, the AAAA batteries have the same length as AA or AAA batteries but are thinner. Some models of 9v batteries are made of 6 AAAA batteries so in case of emergencies you can "attack" a 9v battery to get the AAAAs. The beam is dim as expeced from the regular 5mm led in this light but useful as a small task light or for quick inspections, it has a long runtime of more than 50 hours. The total brightness for the white led version is 10 lumen. The pocket clip is more oriented to a shirt than a pocket because it is rather small, so it can be seen as the regular clip you can find in a pen. The light is available in white, red, blue, green and UV LED colors and several body colors to choose. You can read more about it at streamlight website or order from EDCdepot for $14. 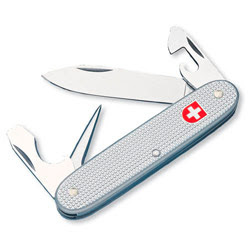 The Soldier is the original model issued by the Swiss Army, it is a simple multitool with just 4 elements and the handles are made of an aluminium aleation referred as Alox. The soldier features a blade, can opener with small screwdriver, bottle opener with large screwdriver and wire stripper and finally a reamer/awl. The blade is excellent, non locking but stronger and thicker than blades in other popular SAK models, it is certainly beyond the category of letter opener and can be used for most common cutting jobs without any problems. Production year is stamped on the blade. The can opener, bottle opener and screwdrivers are the same as in other SAK models, they are strong and functional and in case of need can be used for prying or scraping jobs without breaking them. The awl/reamer is probably the most characteristic item in the soldier since it is not common in other models; it is a very pointy and sharp piece of steel that can be used to create holes, punch, scrape, pry little things and other similar jobs. It can be a handy tool since many times we found a pointy/sharp object is needed and we never have one. It can also become useful as a last resort self defense tool. The handles made of Alox metal are very strong and very stylish, they have a fine knurling job that make the grip excellent and non slippery. The only detail is that there are no toothpick or tweezers in the Alox handles as you can find in the plastic ones. There is no lanyard hole or attachment point so you have to carry it loose in your pocket or in a belt sheath. The soldier is a classic knife that is stylish and functional, if you just want a stylish pack of basic tools of high quality this is an excellent idea. You can get it from Amazon for about $25. The transport is a keychain folding knife by Buck made in collaboration with Peter Whittaker. The transport is 2 7/8'' long when closed (7.3cm) and the blade length is 1 1/4'' (3.2cm). 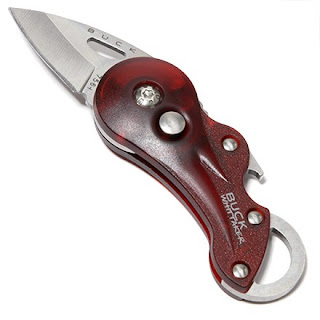 The transport locks and unlocks using a button on the side, interestingly the knife is also locked preventing accidental opening. The transport features a bottle opener incorporated and a lanyard half-hole at the back of the handle. The lanyard hole is generous enough for splitrings, paracord, ballchain and other options. There is no pocket clip. The handle is made of nylon, is strong and has a good grip but may be a little slippery if your hands are wet or greasy. The blade is a drop point made of 420J2 steel. It cuts well and it is pointy enough to penetrate cardboard and similar materials, the short blade will make large cutting jobs difficult but for small tasks such as opening boxes, cutting cord and similar tasks works perfectly well. One thing we liked is that the transport really doesn't look scary at all, you can deploy it and use it at the office, when camping and other public places without scaring anybody. A practical little knife that is accesible and easy to use. The transport is available in red, pink, gray and blue handles for about $18 from REI. You can also read more at Buck's website.